The kids who are a part of the Deux-Montagnes Police Force Hockey Program in Montreal, Quebec, were thrilled recently when they were outfitted with 25 brand new sets of hockey equipment courtesy of the NHLPA Goals & Dreams fund. They suited up Monday wearing their new gear and hit the ice for their practice at the Bell Sports Complex in Brossard, but had no idea the greatest moment was yet to come. 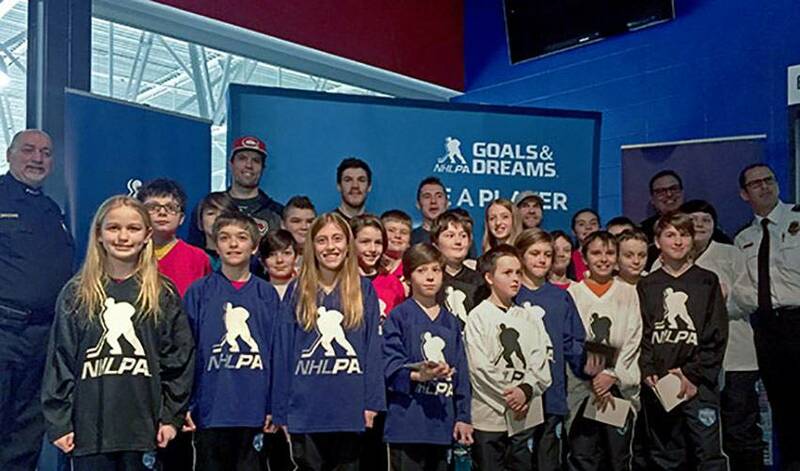 In celebration of NHLPA Goals & Dreams’ latest equipment donation to the Deux-Montagnes program, Montreal Canadiens players David Desharnais, Brendan Gallagher, Andrew Shaw and Shea Weber all stuck around after practice to surprise the kids. Following their own team practice, which the group of children were lucky enough to watch from the stands, the players spent time with the young children to sign autographs and pose for photos. Christopher Harding of the Deux-Montagnes police and Chris Campoli of the NHLPA were also on-hand for the event Monday.